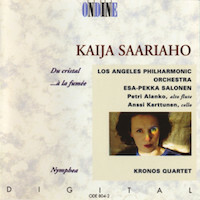 Kaija SAARIAHO: Du cristal (1989-90). SWR Symphonieorchester, Ingo Metzmacher (cond.). Konzerthaus, Freiburg im Breisgau, 23 March 2017. I never thought that I would bother to write about this composer. Time and complacency had conspired to render Kaija Saariaho in my eyes as a formless, endlessly self-repeating moneymaker. Here was a chance to hear her before the sclerosis set in. Indeed, no one has aped Saariaho’s trademarks – scurrying winds, muted brass, an infinity of pitched percussion, high string harmonics, often with subtle electronic embellishment – more than Saariaho herself. In the past two decades, her invention has declined while her remuneration has increased: a metaphor in plain sight. Her more recent work charms, but fails to seduce, being as it is all style in lieu of real expression; as musical foreplay, it leaves both ear and intellect dissatisfied. I had tuned into this concert to hear the Seventh Symphony of Mahler, in another attempt to grapple with his unevenness (see Why Mahler Should Rest), but of course sat through the opener. These 17 minutes proved to be worthier than the 80 that followed. Du cristal, also available on an old Ondine release (ODE 804-2, 1993, Esa-Pekka Salonen / Los Angeles Philharmonic Orchestra), presents a fully-fledged sound world with cogency and only a moderate amount of note-spinning, never intruding on the natural vitality of the musical discourse. Its language is obviously that of Saariaho yet its emotional directness and occasional savagery are seldom found elsewhere in her output. Ingo Metzmacher, a daring conductor never able to hold down any job for very long, for any number of reasons, makes much more of the mood swings and tempestuousness of Du cristal in performance than its dedicatee, Esa-Pekka Salonen, easily in a race with Sir Simon Rattle as the most boring big-name conductor of his era, in his studio account – soporific in excelsis. The Ondine disc is worth having for the companion piece to this one, …à la fumée, if one feels a need to hear the complete diptych, though by then the intensity had already waned if not faded outright. Urgency, once gone, never returns. As an epilogue, I find Toshio Hosokawa to occupy a similar ground: Bright but dull music; more or less the same with each piece; a cloning machine; what is the point? Art is about risks, not safety, which makes him a businessman, not an artist. And an unanswered question for another day: Why must such composers get so many commissions?